As the saying goes, there’s no rest for the wicked. After six weeks of action at Rainbow’s End and a busy schedule at Auckland Armageddon, IPW continues its march toward Nightmare Before Xmas with Time Crisis on Saturday, November 19. The concept behind Time Crisis is new to IPW. NZPWI spoke to IPW General Manager Alfred Valentine for some clarity on what to expect at Titirangi War Memorial Hall. “The first match of the night will have the New Zealand Heavyweight Championship on the line with Curt Chaos taking on ‘The Deal’ Dal Knox,” Valentine said. Every match on the Time Crisis card will be part of the beat the clock challenge. This levels the playing field when it comes to the Nightmare Before Xmas main event. Time Crisis opens the door for a quick roll-up or an expertly-applied submission to catapult any member of the IPW roster straight into contention for the IPW Championship. JB Bennett or Mitch Gray are just as likely as Brook Duncan or James Shaw to advance to Nightmare. “Wrestlers like Mason Daniels, Mitch Gray, Michael Richards, Oliver Griffin and Brodie Coast, they are the future and working with them has been a lot of fun,” Valentine told NZPWI. 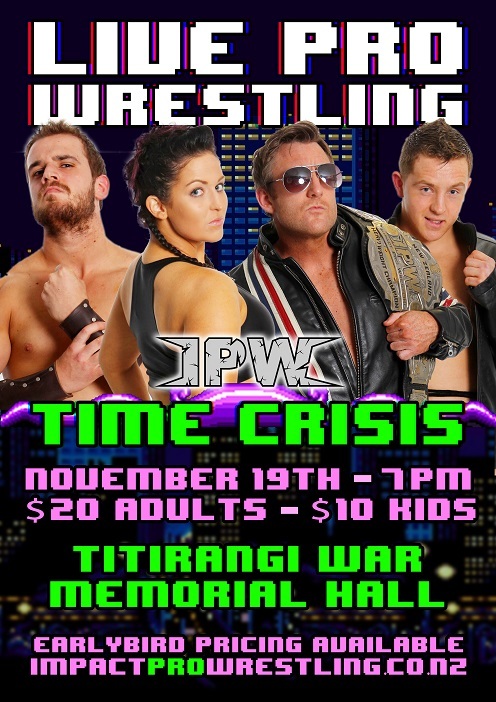 IPW Time Crisis takes place at Titirangi War Memorial Hall on Saturday, November 19. Tickets available from Eventfinda.